With a regular use of NATURINA Hairtonic started at the right time hair problems can be prevented early. It is hair care for the whole family. For an effective hair care a hairtonic should be used, as it has the nutrition function for the hair. Other products do not fulfil this purpose. 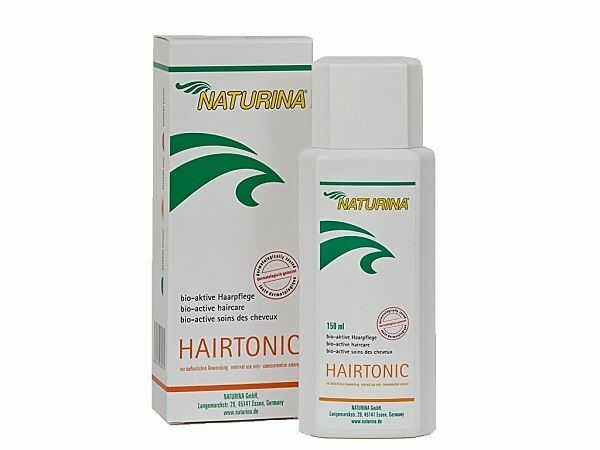 NATURINA Hairtonic contains vitamins to activate the scalp. The special active ingredients like pirotoneolamine work against dandruff - as well as niacin, menthol and the extract of horse chestnut for better circulation. Cystine as an important component of the hair building substances, Keratin which assures the elasticity of the hair. Only substances from ethereal oils giveNATURINA Hairtonic its perfume. Healthy hair looks good. It underlines your personality and stands for vitality. You can see a lot about people from their hair. People who make the most of their hair make the most of themselves. The body needs a well-balanced and sufficient intake of vital nutrients. If there is no such intake then the balance is lost. 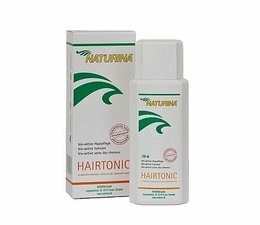 NATURINA Hairtonic contains all the natural and mild ingredients in sufficient supply and sensible amounts. In order to prevent allergic reactions and skin irritations there are no chemical additives, no perfumes or conserving agents and it is pH neutral. We can't promise miracles. "New" hair can only grow when the roots have remained capable of growth. For many years now we have carried out intensive research to improve our products and we can rightly say that we are at the most up-to-date level of development. Our products are tested dermatologically. We only use natural raw materials, no chemical additives. We reject the use of any animal substances. Shampoo. For haircare from within - NATURINA Capsules.